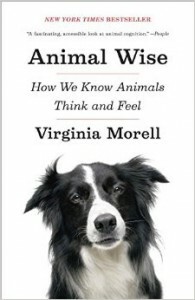 Animal Wise takes you down a sweep of the historic animal cognition research to date. Its author, Virginia Morell, is a science journalist. She takes us through pain in fish and self recognition in dogs, and explores plenty more intriguing animal cognition questions. A true gem of a book: as scientifically rigorous as it is pleasant to read. This entry was posted in Dog writing and tagged animal behaviour, animal cognition, animal emotions, animal feelings, animal intelligence, animal thinking, canine intelligence, cognitive ethology, critique de livre sur les chiens, dog book review, dog cognitive ethology, dog intelligence, hondenboek recensie, zoology. Bookmark the permalink. Post a comment or leave a trackback: Trackback URL.